Just because your tank is corroded or leaking, it doesn’t automatically mean a replacement is required. In many cases professional repair and refurbishment work is a cost-effective alternative. 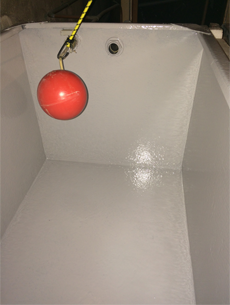 North East Water Management are an approved applicator of a solvent free polyurethane which has been specifically formulated for water tank coatings and water tank lining. We provide long-term protective solutions to combat the problem of corrosion and erosion of water storage tanks utilising high performance, solvent free technology. 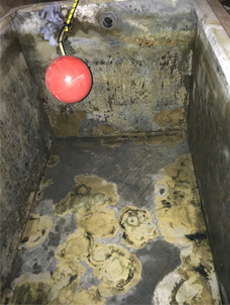 Our specialist water tank refurbishment service can restore existing water storage tanks to Safety, Health and Welfare at Work Act 2005 (No. 10 of 2005) HSE and Water Supply (Water Fittings) Regulations 1999 standards. Whether you need a water tank repair, water tank refurbishment, or a tank coating, North East Water Management can help you! Tanks should have tight fitting lids with screened air vents and overflows, we at North East Water Management now manufacture lids to conform with current water fittings standards, this is a service we offered as we realised that lids are not available for many types of tanks, especially the older types. Concrete Tank and Rain Water Harvesting Reservoirs. Call or email us to make an enquiry on our specialist tank services.